We just returned from the Fall National Association of Broadcasters convention in Washington, D.C. The mood was significantly more upbeat given the positive growth in radio revenue this year. One of the key themes of the convention was developing a digital strategy. Of course there are those who don’t want to acknowledge that the world has changed. Advertisers now have a way to measure results and be more efficient in their advertising expenditures. This structural shift in advertising has taken a heavy toll on traditional media including the radio industry. Lay a recession on top and well 2009 was a year the industry would like to forget. 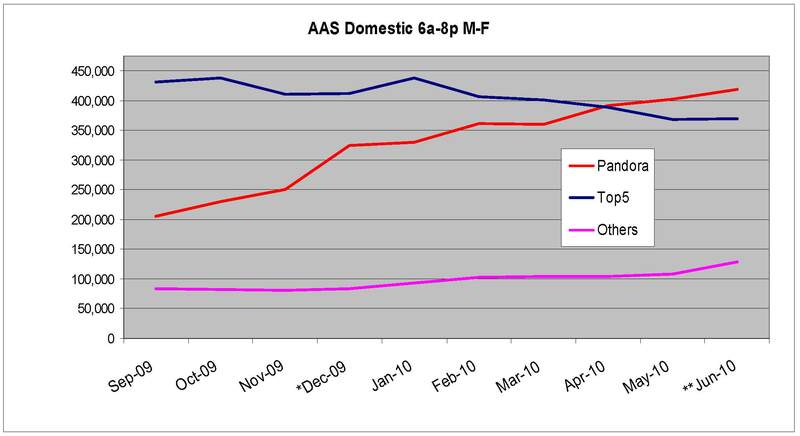 However, increasing revenue in 2010 has caused some to believe that “radio is back” and that digital is not important. The radio industry is confused as there are so many different strategies and groups hawking digital initiatives and tools including social, web site, mobile, couponing, etc. Some of these products have a “cool” factor but I question the ability for a station to generate revenue given what little resources are being devoted. Just having a tool does not lead to revenue generation. In one of the panels a gentlemen lamented that he had done everything recommended, he had a non-station centric website, he was streaming, using Ando, but had no clue as to how to effectively monetize it all. Someone needs to bring some order and research to this chaos. In future blogs we plan on addressing each of the silos in a station’s digital media arsenal. http://www.angelstreetcapital.com/images/logo.png 0 0 Robert Maccini http://www.angelstreetcapital.com/images/logo.png Robert Maccini2010-10-01 13:50:202014-04-06 09:44:16Back from NAB in Washington, D.C. While the answer to this question is yes – not all stations are sharing in this growth. For the period September 2009 – June 2010, Internet radio listening to the top 20 audio groups increased 27.2%. Unfortunately terrestrial radio, including even the largest broadcasters for the most part, is not sharing in increased audience levels. As you can see below, the one entity enjoying substantial growth is Pandora. Since Ando Media, LLC commenced measuring Pandora’s audience (Sep 2009), Pandora has seen a 103.9% increase in its audience while the top 5 station groups (excluding Pandora) actually declined 14.8%. The top 5 radio groups include the large terrestrial broadcasters such as CBS (CBS includes Yahoo and AOL) and Clear Channel. [Please note all data analyzed herein was taken from the monthly audience information prepared and made publicly available by Ando Media, LLC based on 6 AM-8 PM Monday-Friday]. Measurement of Pandora commenced in September 2009 and at that time Pandora’s audience share was slightly smaller than that of CBS (note September results for Pandora did not include mobile measurement). In the month of June 2010 Pandora represented 45.7% of all listening based on the top 20 Internet radio streaming entities as measured by Ando Media, LLC. This percentage increased from their 28.5% share of the Top 20 in September 2009. Internet only radio groups in the June ranker accounted for approximately 50% of all listening. I can only conjecture as to why Pandora is enjoying audience success. I believe there are two themes here (1) Pandora’s ability to customize a user’s listening experience – Terrestrial radio is taking the exact same programming from over the air and streaming that programming. The presentation and interface need to be customized for the channel where it is being consumed. A Pandora listener can be active and create new channels based on multiple song/artist input or choose a format of music depending on mood. (2) Ad Inventory – Terrestrial radio’s high number of ad units per hour cannot effectively compete for audience where a strong competitor is carrying 1/10 the amount of ad inventory. 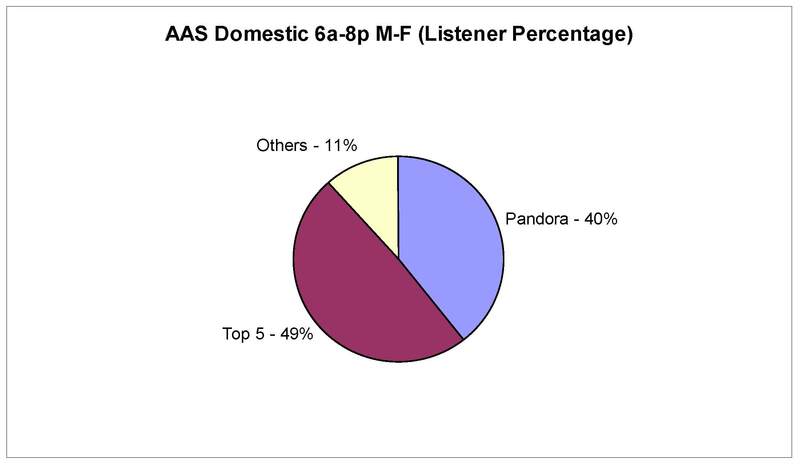 This low inventory load is not only true of Pandora but for most internet only stations. The type of ad inventory also matters. For example, 60 second commercials drive listeners to other alternatives. While it may be argued that the internet only stations low commercial load means they are not monetizing their streams today, where audience exists, advertising will follow. Targeting – Given Pandora’s required registration and technology it is able to target advertising to specific listeners based on location, gender and age. This makes the user experience more customized allowing relevant content to be served. While many terrestrial streaming stations have the ability to target it is typically only based on geography as other listener data/registration is not required of listeners. Pandora’s audience is almost 10 times the size of the largest terrestrial station’s off line audience. Given Pandora’s audience size they will be successful in leveraging their way into mobile and in car devices). Terrestrial radio is fragmented and for the most part they cannot agree on a unified approach (as evidenced by the current controversy over the radio royalty proposal organized by the NAB). Pandora has announced a local sales initiative which will result in them being a competitor for not only national advertising but also in a broadcaster’s backyard advertising market. Terrestrial radio has a window of opportunity to capitalize on IP delivery of its content. However, just continuing to stream their existing commercial laden content will not work in the new ecosystem. Robert Maccini was a founder and previously served as the CEO of Ando Media, LLC the leading internet radio audience research firm. He was also a founder of Net Radio Sales (which was sold to Katz Media), the leading internet radio rep firm. Mr. Maccini can be reached at rmaccini@angelstreetcapital.com or 401-854-1850. Angel Street Capital provides consulting and investment funding for digital media start up companies.